This is the first installment in an occasional series profiling Texans who are involved in various activities related to climate change. Ten years ago, in May 2006, a documentary about former Vice President Al Gore’s slide show on climate change was released in theaters. Entitled “An Inconvenient Truth,” it went on to win an Academy Award and has been credited with playing a key role in building public awareness and concern about global warming around the world. Gore was awarded the Nobel Peace Prize in 2007 for his educational efforts regarding climate change. 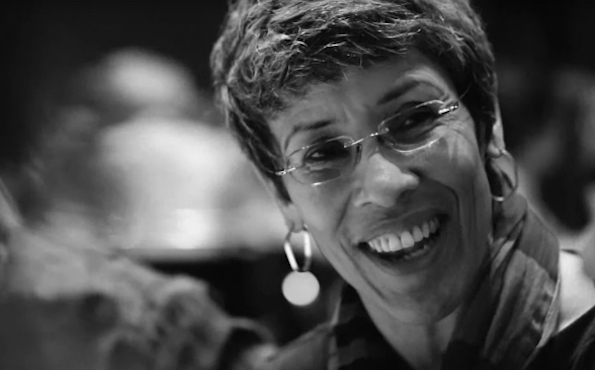 One of the many people affected by Gore’s explanation of climate science and call to action against climate change in the film was Susan Pacheco, a Houston pediatrician and associate professor at the McGovern Medical School at the University of Texas Health Science Center at Houston, who attended a screening with her husband and their three children. From Aug. 16-18, one of the three-day trainings will be held in Houston – the first one in Texas – and Pacheco will be there, along with Gore. [Enrollment application.] She was so strongly influenced by his message in “An Inconvenient Truth” in 2006 that she enrolled in the second Climate Reality Project training, held later that year in Nashville, and has been an active volunteer mentor with the organization ever since. She has also been working in various ways to inform others about climate change in Texas, including her Houston patients and their parents and her UTHealth colleagues and students. The film, however, immediately opened her eyes to the climate issue in a compelling and unexpected way. Feeling that she has a “moral responsibility – as a person and a doctor,” she has been actively spreading the word about climate change, especially its health-related implications, in a variety of ways. As a specialist in pediatric asthma and allergies, for example, she said she tries as much as possible to incorporate climate-related information about subjects such as air quality and the air quality index into her conversations with patients’ parents. Changes in the climate affect the air we breathe, both indoors and outdoors. The changing climate has modified weather patterns, which in turn have influenced the levels and location of outdoor air pollutants such as ground-level ozone and fine particulate matter. Increasing carbon dioxide levels also promote the growth of plants that release airborne allergens (aeroallergens). Finally, these changes to outdoor air quality and aeroallergens also affect indoor air quality as both pollutants and aeroallergens infiltrate homes, schools, and other buildings. Poor air quality, whether outdoors or indoors, can negatively affect the human respiratory and cardiovascular systems. Higher pollen concentrations and longer pollen seasons can increase allergic sensitization and asthma episodes and thereby limit productivity at work and school. Some of her patients, Pacheco said, experience other health-related and physical challenges because they’re especially sensitive to heat. With these children and their parents, she discusses evidence that global warming is increasing temperatures, health problems that can occur with heat exposure, and the importance of paying attention to weather forecasters’ heat index numbers. She has also been working to increase climate awareness among other groups, including medical students at UTHealth. Medical students are in particular need of climate-related information, she said – despite growing evidence of multiple links between climate change and various medical and public-health problems, for instance, only one of the prospective students she has interviewed for possible admission in recent years was aware of such connections. Relatedly, she has been working with others on a policy statement and technical report about climate change and children’s health for publication by the American Academy of Pediatrics. Another of her initiatives is the Texas Coalition for Climate Change Awareness, an organization she founded to bring together people from diverse backgrounds and affiliations to collaborate on finding ways to increase people’s attention to climate change in the state. 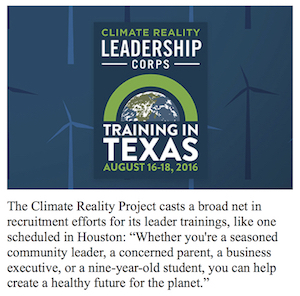 While there are many people attuned to climate issues in Texas, Pacheco said, many are “acting on their own” and can perhaps be more effective through joint action – a group of mothers dedicated to communicating with other mothers, for instance. Looking ahead to the Houston training session, Pacheco said she will be stressing that those who attend should “work within your reality” with the information they receive. “I will never be Al Gore, I’ll never be able to do what he does,” she added. But she has found ways to try to advance climate awareness and action in ways that are appropriate for her own circumstances and believes others can do the same. Bill Dawson, a journalist based in Houston, is the founder and editor of Texas Climate News.